We often hear that energy efficiency saves money and creates jobs, but what do we know about its public health benefits? 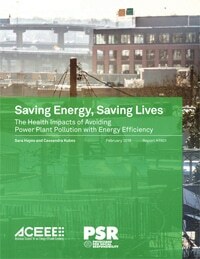 PSR and the American Council for an Energy-Efficient Economy (ACEEE) released a report, “Saving Energy Saving Lives,” that examines the public health benefits and medical cost savings of cutting annual electric consumption by 15 percent. The report also ranks the top beneficiaries among the states and the 50 largest U.S. cities. More than six lives saved each day. Up to $20 billion in avoided health harms. Nearly 30,000 fewer asthma attacks.